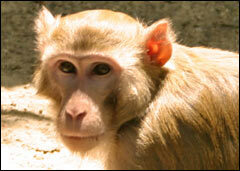 Context - Every year, more than 100 000 monkeys and apes are used for biomedical research around the world. Their genetic similarities to humans make them particularly suitable candidates for testing the safety of new drugs and for studying infectious diseases or the brain. But those very similarities to humans also raise specific ethical questions about their use for scientific experiments. Are there alternatives to the use of non-human primates in research and testing? Would it be feasible to stop using them altogether? An assessment by the European Commission Scientific Committees on Health and Environmental Risks (SCHER). Around 12 million animals are used each year in scientific procedures in the EU, and among these, around 10 000 are non-human primates (NHPs), mainly monkeys and apes. Experiments on such primates have lead to important findings in biology and medicine. Currently, primates are only used in animal experiments when there are no suitable alternative methods or species. They are mainly used for safety testing of pharmaceutical products and devices, but also for fundamental research in biology and for research and development of medical products and devices. Nearly all primates used in scientific experiments are born to animals that are themselves bred in captivity, sometimes for several generations. With some exceptions, research on animals that are bred rather than caught in the wild tends to deliver more accurate and reliable data. Primates caught in the wild are very rarely used in research but are still needed to avoid the adverse effects of inbreeding of stocks. 3.1 Because of scientific reasons, testing pharmaceuticals on non-human primates is in certain cases a very small but almost compulsory part of the global testing procedure, especially for drugs and vaccines that involve the immune system. 3.3 Non-invasive techniques that study the brain without entering the skull are very useful and promising to understand healthy and diseased brains. However, such techniques are not yet as informative as invasive methods and still need to be further developed. In the foreseeable future, experimentation on non-human primates (NHPs) is unlikely to be completely replaced by laboratory methods or by test on other animal species. For the safety testing of new pharmaceuticals, primates are also likely to remain the most suitable mammals. To study HIV infection, genetically-modified mice will probably be available in the future. However, for scientific reasons, studies using mice cannot completely replace those using primates. In research on the brains’ structure and function, non-invasive techniques which do not require entering the skull and computer modelling can be used alongside invasive methods but cannot replace them completely. However, new techniques and technologies are developing quickly and advances must be assessed frequently. By analysing more carefully the results of drug safety experiments carried out first on rodents such as rats and mice, then on dogs and other non-primate mammals. This could reduce the numbers of primates needed, although it might increase testing on other mammalian species. By reusing the same non-human primates in different experiments. There are regulations to avoid the same animals being continually re-used for experimentation, but overly restricting the re-use of primates could increase the overall number needed. By making current animal tests for reproductive toxicity more effective so that fewer primates are needed. By improving communication between facilities that carry out experiments on animals so that they share information, ideas and expertise and avoid duplicating experiments. By encouraging the development of new techniques that may reduce and partly replace the use of non-human primates in testing of medicines, vaccines, and drugs used in animal-to-human organ transplantation. There are several ways to enhance the welfare of non-human primates (NHPs) in scientific research. The importance of the physical and mental well-being of primates should be acknowledged. New standards of care, treatment and living conditions for primates used in research and testing should be adopted as soon as possible. More research is needed to understand the impact of pain and distress on animals and to recognise the signs of suffering. Experiments should be designed so as to minimise pain and discomfort. Testing should not last longer than absolutely necessary and should be stopped early if there is significant pain and distress. The use of ‘non-invasive’ technologies which do not require entering the body or puncturing the skin, such as magnetic resonance imaging (MRI), should be improved and increasingly used. In the case of vaccine research, tests should be stopped at humane limits (endpoints) set beforehand, for instance as soon as early symptoms are detected. The Scientific Committee on Health and Environmental Risks (SCHER) concludes that, because non-human primates (NHPs) have close and sometimes unique similarities to humans, their use remains necessary in the safety testing of new pharmaceuticals and in several areas of biomedical research, such as research on infectious diseases and on the brain. The SCHER considered only scientific aspects, specifically excluding ethical, economic, cultural and social considerations which will be addressed by other groups. At present, the SCHER sees no valid scientific arguments to stop using non-human primates for scientific research and drug safety testing, but this position should be frequently reviewed as new alternatives are constantly being developed. Non-human primates should be used only when this is scientifically justified. Tests on cells grown in the laboratory, computer modelling, and improved techniques which do not require entering the skull should be encouraged. The replacement of primates by other animal species should be further investigated. Coordination and communication between facilities doing animal testing should be improved to avoid duplication of tests, to optimise procedures, and to minimize the numbers of primates used. Any tests on primates should cause as little pain and distress as possible, and not last any longer than necessary. Housing and breeding of primates should follow high standards of care, consider their welfare as well as their physical and mental needs. The use of primates caught in the wild should be discouraged for both scientific and animal welfare reasons. Research that leads to further replacement, reduction and refinement of the use of primates should be promoted.